So you’ve decided to start blogging for your business and feel like you have a basic handle on how to create content… great! I applaud your effort and want to support you in this endeavor. I have been helping businesses grow through blogging for over 5 years and have learned a few things that I would love to share with you. While great content is critical, there are 2 cardinal concepts to keep in the forefront of your mind when creating your content. These 2 simple concepts, if you put them into practice, will help you achieve tremendous results with your blog. First and foremost, connect with your reader. You want your content to create a connection with your readers. I really mean it. Connect. As human beings we are wired for connection. It’s how were made. We’re built for relationships. “How?” you ask… Good question! This scares a lot of people. You might be thinking, “Well, if I give it away, why will they need me?” Trust me, they will be more apt to do business with you because of your generosity! And please don’t give a continuous sales pitch. This is the fastest way to lose people’s attention! And they will not feel like coming back to you or your blog if you all you want to do is sell them something. 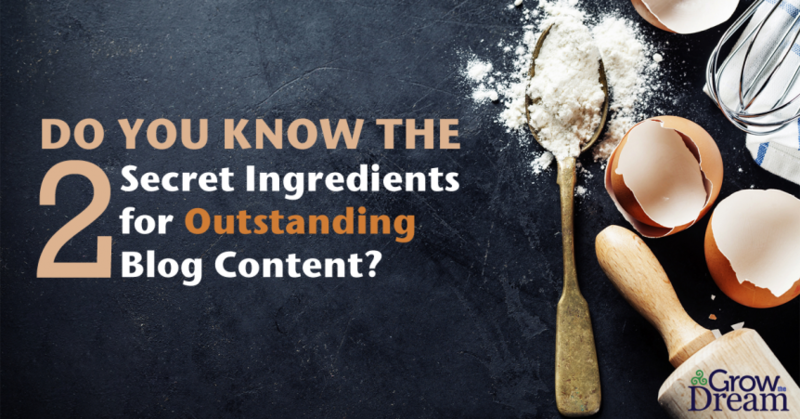 How often you post plays an extremely important role in content creation. Create a schedule and stick to it. Be consistent. When readers see you, week after week, month after month, year after year, cranking out solid valuable content, giving away information, creating connection and relationship, you will establish credibility in their minds. And when it’s time for them to hire someone in your line of work, you will be at the top of their mind. Google likes content. Fresh content. Valuable Content. As content creators, we don’t chase all the new google algorithms and the like (because they always change! )…we create content because it is a wise thing to do. You are crafting your message, connecting with people, and adding value to the world. That’s why we create content, but…it doesn’t hurt that google likes it and it will help you rank in search engines. So remember: Connection and Consistency. Write these words down and keep them in front of you when it’s time to blog. These may seem like 2 “small” things, but they will make a tremendous difference in your business if you apply them. Yeah, the content should be fresh & valuable and also it should be according to Google policies. Anyways, the stuff you have posted to get fantastic results with the blogging is really amazing!